So we are sitting here in the middle of nowhere at a gas station, not for gas but for internet, so here goes with my first update in a number of days. Trapped between the desiccating sands of the Namib and the freezing waters of the South Atlantic’s Benguela current, Lüderitz is a fascinating old German town, full of character. There is only one road to Luderitz, and bulldozers battle to keep it open through the shifting sands of the Namib. Meanwhile, on the coast, the beautiful buildings of this historic German town sit unchanged. Our true destination was the ghost town of Kolmanskop. This ghost town, once the principal town of the local diamond industry, was abandoned over 45 years ago and now gives a fascinating insight into the area’s great diamond boom. A few of the buildings, including the imposing concert hall, have been restored, but many are left exactly as they were deserted, and now the surrounding dunes are gradually burying them. Moving from building to building and room to room, the photographic surprises were everywhere however, they were not without technical challenges. This challenges, for me, included shooting a medium format camera in very close quarters, rapidly changing light conditions and I really mean rapidly changing, and exposure control that was over the top. For this location, I was shooting both Hasselbald with a 35-90 zoom and a Nikon D800 with a 14-24mm Nikkor. 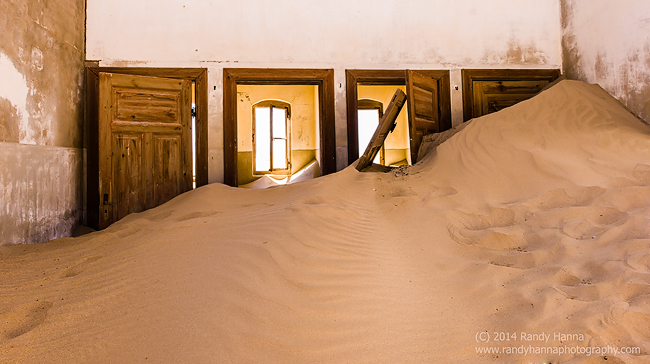 The images below represent first exposure to Kolmanskop. I must admit, it took me a bit to get my head around just how to shoot this and identify the pitfalls with the dynamic range. Heavy wind and face blasting sand, forced me to pack my gear inside each of the houses every time before moving onward to the next building.